When it comes to breakfast nothing beats the fluffy pancakes, they are so versatile, you can dress them up to fit the occasion. Since December is a festive month, I want my breakfast to reflect the flavors of the holiday season. Nothing speaks “holidays” than apples and cinnamon, Just the thought of it brings warmth to your heart. 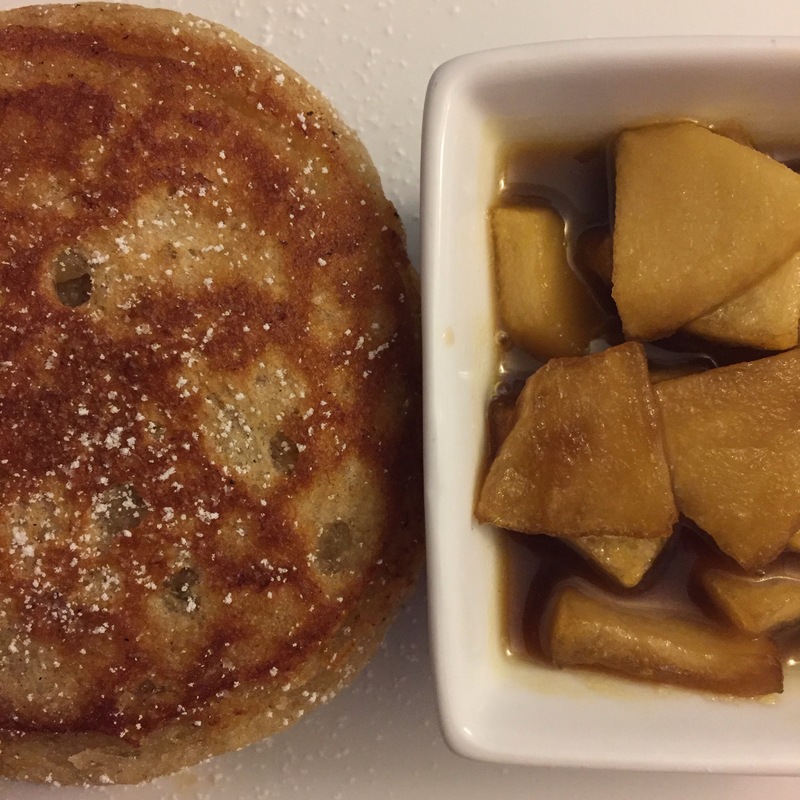 So I make this warm apple syrup flavored with cinnamon and serve it with the soft almond flour pancakes, dusting it with powdered sugar reminds you of the light snow on a cold winter morning. The best part is, its eggless and gluten free. It’s making your mouth water right ?. Come on! Let’s make the syrup first so it will be ready by the time we get the pancakes out of the griddle. 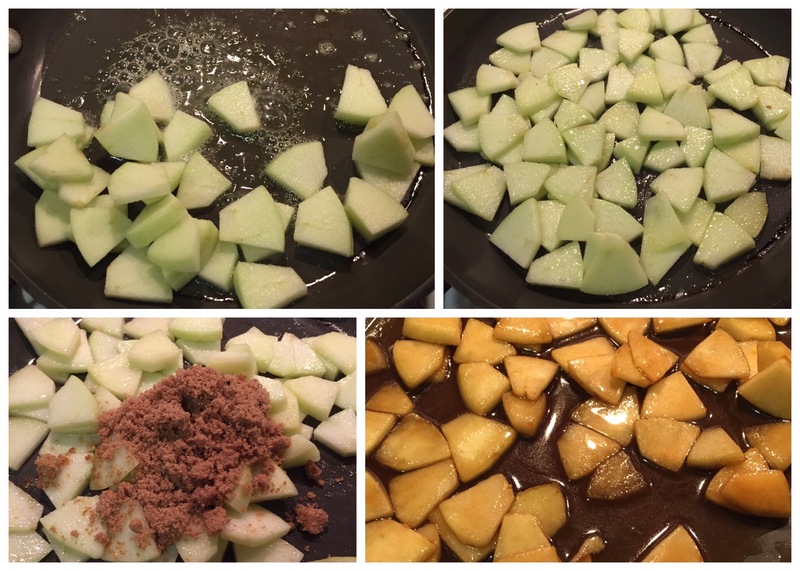 I have used Granny Smith apple because they hold the shape very well. You can use your favorite kind. Sauté them until the apples are slightly soft but should have a little crunch to it. Add the cinnamon and brown sugar, let it simmer and make a beautiful syrup. Switch off the stove. Let the syrup stay in the pan until the pancakes are ready so it’s nice and warm. 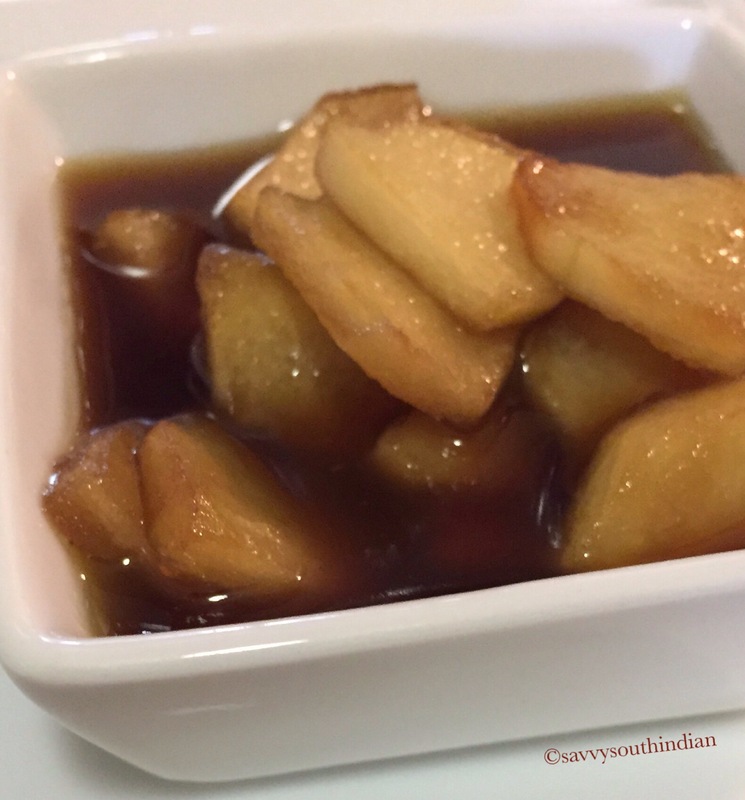 The syrup has just the right amount of sweetness which is balanced very well with the tartness of the apple. Doesn’t this look yummy ? You can also use almond milk , coconut milk, soy milk or evaporated milk. Make sure the milk is at room temperature or slightly warm. Mix all the dry ingredients nicely, then pour the wet ingredients and combine it well. Let it rest for sometime. Do not over mix otherwise the pancakes won’t be soft and fluffy. The almond flour tends to absorb the liquid so the batter will be thick don’t add any more liquids otherwise it will be runny and it’s very hard to flip them. Heat the griddle, rub some butter on it. Use a ladle and pour the batter. I use the rings (meant for eggs) to get the perfect shape each time. If you use these rings make sure you grease them before use. Once this side is cooked take the ring out, flip it and let the other side cook. Dust it with powdered sugar just before serving it. Look at these soft and fluffy pancakes, I bet you can’t stop with one. 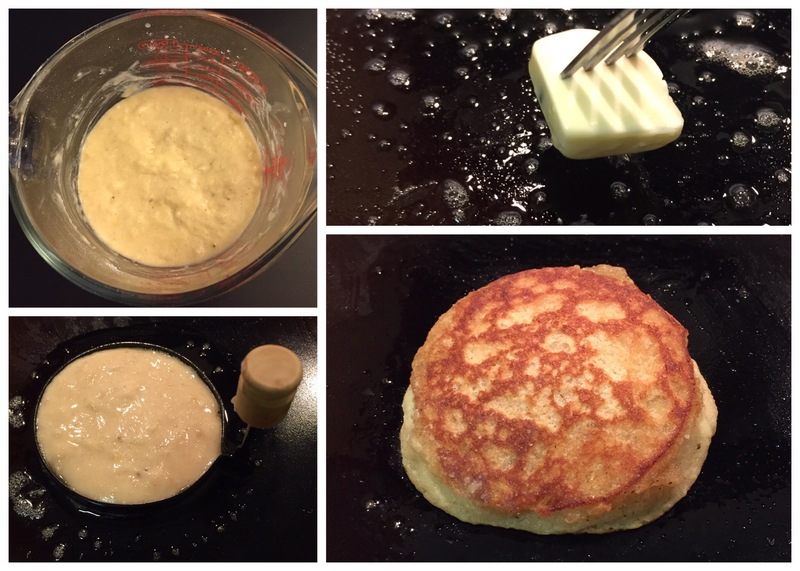 Baking soda creates these tiny craters on the pancake which helps absorb the syrup nicely. Pancakes taste awesome when it’s nice and warm, so plate it up the minute you take them out of the griddle. I like to serve the syrup on the side… But my kids just drench it with the syrup.. Which ever way you eat it, it tastes delicious ! 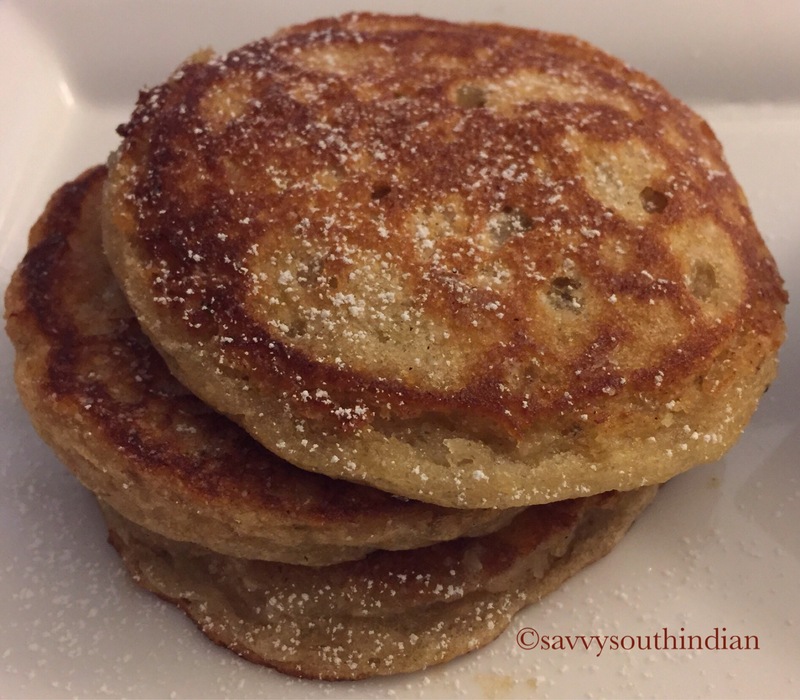 Apple and the almond flour gives a nice texture,the smell of Vanilla and cinnamon screams holidays… What can I say, this is one awesome breakfast I would love to wake up to. If you are planning to make a special Christmas morning breakfast to impress your loved ones, these pancakes are for you. Enjoy !! I will definitely try this with my remaining almond flour 🙂 am sure my kids will love it! 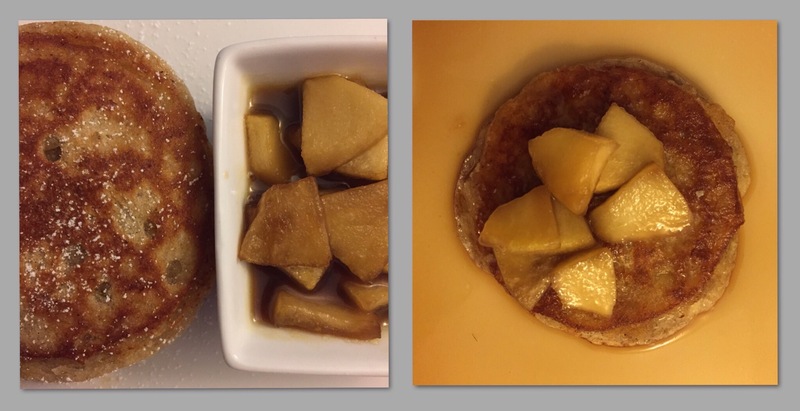 It’s so yummy … Mouthwatering…I luv pancakes…. Yummy holiday treat. Your posts are mouth watering with perfect shots.